Officers arrived just in time to stop a masked gunman trying to flee from the bar he’d just robbed. “Drop the gun! Drop the gun now!” the police officer yells. The man turned toward the police and an officer fired a shot that missed hitting the man wearing a ski mask. Jim Duff, an actor, dropped the fake gun and pulled off the mask while telling the officers, “This is a movie set,” The Associated Press reported. 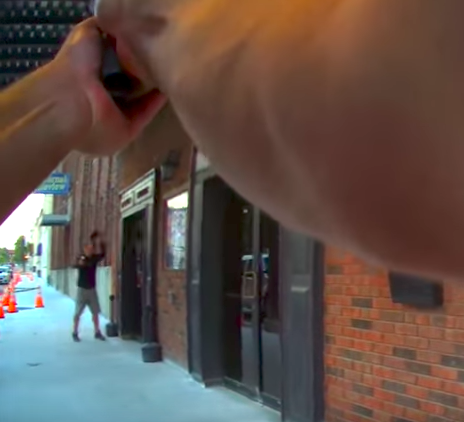 The entire scene, which took place in Crawfordsville, Indiana, was caught on the officer’s bodycam released by Indiana State Police, the Miami Herald reported Tuesday. It’s unknown what movie was being filmed. No one was hurt on the scene. Turns out, on Sept. 26, someone had called 911 in the western Indiana town to report an apparent armed robbery in progress at Backstep Brewing Co., according to WXIN-TV in Indianapolis. Police say the production company and the brewery didn’t notify them or other businesses before filming, the AP reported. The caller told the 911 dispatcher that a man walked into the bar wearing a ski mask and holding a gun, the report said. When officers arrived, WXIN said, they saw the masked man, leaving the bar and still holding the gun. “He was the only person that backed out, the only one that came out and he was in a ski mask and holding a weapon. Whether it’s real or not, you don’t know that at the time,” Sgt. Kim Riley of the Indiana State Police, the Belleville News-Democrat. “We could not see the police, so when the actor left the building we had no knowledge any police had even arrived at the scene,” Philip Demoret, owner of the production company, told the TV station.